Chances are you are constantly logged into to one of the amazing social media apps that most of us use daily. While there are so many social networking platforms, these sites can be more than just catching up with old friends; they can be the best marketing resource you have in your business! Which is why consistency with these platforms is key. I (along with many of my blogger friends and my students) have been paid thousands of dollars to talk about things that we love on social media platforms like Instagram and Facebook. To my fellow influencers out there, this may not seem like a shock. But it’s still kind of…crazy, right! I mean, why are companies putting millions of dollars into the hands of influencers every month to talk about products, ideas or places they are passionate about? Because when you un-tap the power of these apps and learn how to leverage them to reach your ideal clients, it can entirely transform your life and your business, and be a major sell-through for companies. Win Win! Let’s throw it back to October 2013 when I had less than 2,500 followers on Instagram and had no strategy in place with my online brand and social media. Today I am on the cusp of 30K…. that’s an 1100% increase in a matter of 3 years. But here’s why this matters. It isn’t about popularity, it’s about growing the RIGHT audience, and I’ve managed to do just that with consistency! I am always a supporter of the turtle in the race. Just because you didn’t grow 10,000 followers overnight doesn’t mean that you should call it a day while crying in a tub of ice cream. It’s just about noticing this little improvements, the day by day small growth --- as that is what leads to long term growth. So let me share with you a few tips on how to stay consistent with your social media brand in a way that will help you grow and profit long term. Don’t Be An Online Catalog: It’s easy to think that your social media should be flooded with your #OOTDs, what you wore todays or just your work. Instead, share things about your life! Share about your pets, or your kids, or your travels. While it sounds silly, your ideal follower needs to connect with you, so they then can trust you, buy from you and grow with you. You are more than your work and your cute outfit from Nordstrom, so choose things you are comfortable sharing and keep it cohesive and consistent! PRO TIP: Once a week, schedule out a post that has nothing to do with your work or your affiliate links. Ask your followers to share something about them selves in return. And see your engagement skyrocket! Images Matter: Your feed is a curated look that gives the audience a 360 view of your life. Make sure every post is a reflection of your brand and is up to par in terms of the quality your followers can expect from you! Instead, reach out, leave meaningful comments, ask questions, connect with people and send some encouragement! It’s called social media for a reason… you have to be social. If you wouldn’t walk up to someone in person and say “love your feed”, then you shouldn’t be doing it on their social media comments either. When I really, and I mean really started being intentional with my connections on Instagram, everything changed for me in terms of authentic growth. PRO TIP: Take 10 minutes each day to find accounts that you are genuinely attracted to and you would think would be attracted to your brand, and authentically engage with them. Ask questions, then go back to them a couple of days later, and then again. Stay with them, support them --- I promise you will see it in return ten fold. Captions Are King: Captions are the best way for you to connect with an audience and build a consistent brand. PRO TIP: Take one day a week (for me it’s Sunday) to plan out your captions for the week. Get them drafted so you aren’t overwhelmed in the moment. That way you only need to go back with minor edits, if anything, and you are ready to post a truly engaged photo! Put them in the notes section of your phone, its easy to copy and paste that way. It really does help. 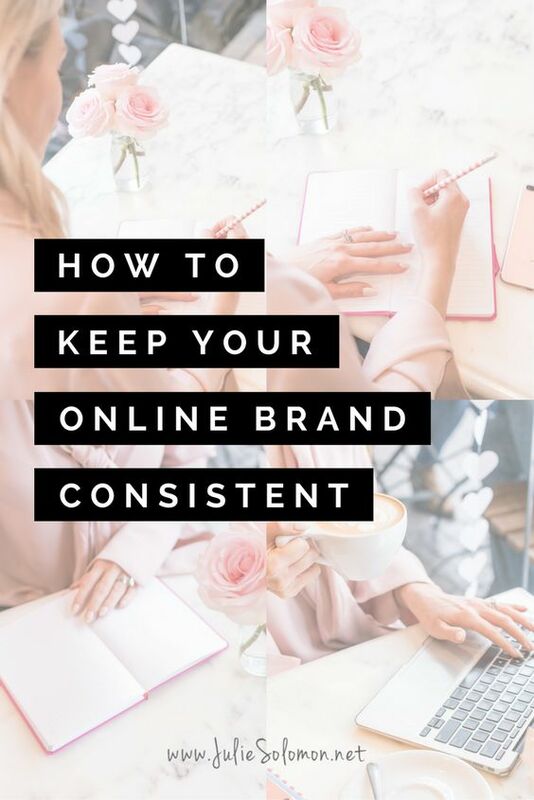 For a TON of other quick tips to keeping your online brand consistent, download the FREE worksheet below. How do you keep consistent on social media? What have you found that works well, and what have you found that doesn't? Any advice to share with us? Please leave your comments and thoughts below by clicking the "comment" button at the bottom left.